Drone photo by Alex Haggart for Motor City Muckraker. Note: Sen. Carl Levin was emailed this letter more than a week ago and his aide confirmed he received it. He has not replied. Once we were on the same side when it came to saving Tiger Stadium, two decades ago. 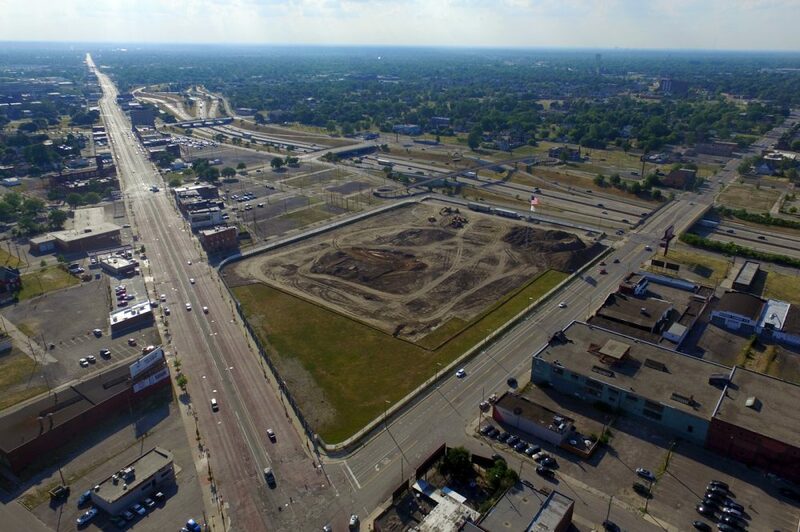 The PAL project at Michigan and Trumbull – which is right now destroying the historic field in order to “save” it – hardly qualifies as “preservation” since the grounds will be covered with artificial turf. I believe PAL sold the project to the Old Tiger Stadium Conservancy, to you personally, and to foundations funding it without fully disclosing the organization’s commitment to a synthetic surface. Now that demolition is under way, PAL spokesmen have revealed that 50 percent of the field’s use will NOT be for youth sports, after insisting (falsely) for a year or more that their youth sports programming would be so intense that natural grass could not hold up. Whether rentals and concerts constitutes the “business activity” you intended, it certainly doesn’t appear PAL’s field will be a “public park” in any meaningful sense at all. I don’t see how this intended use qualifies under the language of your grant. Perhaps it is too late to undo it in any way, now that the city has sold the land to PAL for $1. Perhaps you don’t want to rock the boat. But to my mind, you are the one person who by speaking out now against this project could at least persuade PAL to use natural grass – and hopefully have them live up to their promise that the field would in fact be used predominantly for youth athletics. The amount of deception PAL has engaged in to get the crucial $3M federal grant without which this project could not have happened is, I believe, an insult to you and your legacy, to the citizens of Detroit and Michigan you so long and honorably represented, and to any notion of historic preservation. PAL will not be doing ANYTHING meaningful to honor the history of the site they have commandeered through a series of lies and betrayals. Those of us who cared a lot about this place did not get the truth – and many of us did not even get a seat at the table. Instead, we got swindled. It’s a shame, sir, and it’s not right. Don’t let this be part of your legacy. You cannot shame Levin, dont even try. He has no shame. He has no doubt done this thousands of times, yet you laughably think he had a great legacy, up till this happened near your home. Thank you for saying what thousands of people believe to be true. All of us have been ignored until you solidified our disappointment here.